Aikido is a Japanese martial art, purely based on self defense. It aims at diffusing an aggression without injuring the attacker. Stylewise, it is a mix of Judo and Jui-Jitsu without any strikes or kicks. How effective is aikido as a martial art? It depends how you judge efficiency. Aikido is a purely defensive art and it strives at not hurting the opponent. In doing this it is not only very effective, it is absolutely unique in its methods. Where does Aikido come from? Aikido is a relatively new martial art, yet still of very noble decent. Its founder refered to as O-Sensei is Morihei Ueshiba. He was born in Japan at the time of the Meijin Revolution which saw the abolition of the Samurai class. Aikido is said to have come to him in a moment of Zen enlightenment. It is then, with his extensive background in martial arts that he focused all his energy to create and art where both people entering a fight could come out uninjured. O-Sensei died in Japan in the 60s. 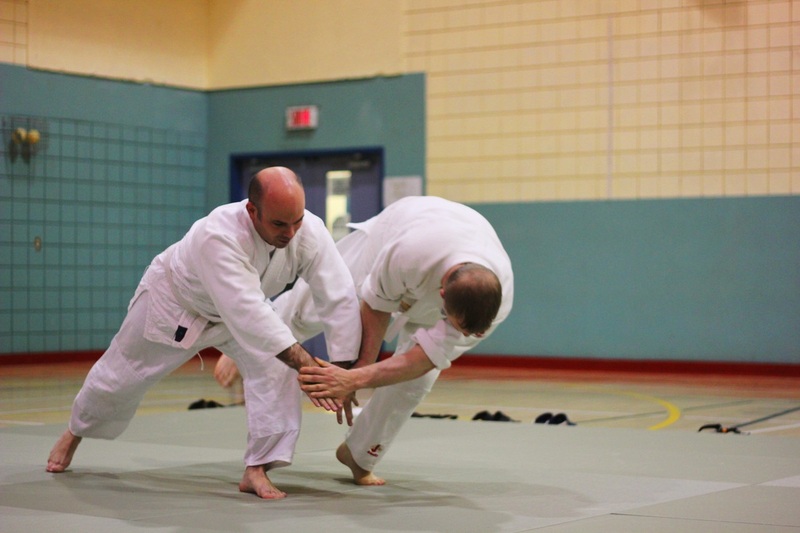 What is Aikido like, how does it do what it claims to do? Aikido is an art of subtleties. Aikido seeks to redirect the opponents negative energy away from the attack. What that means, in practice, is that instead of blocking a blow, the Aikidoka learns to move out of the way of the blow, absorb the blow and blend with it, and through various technique use the force behind the blow and add his own force in essentially the same direction. By doing this the opponent is put off balance momentarily. Once this is done, the aikidoka learns to keep his opponent off balance just enough to bring him where he needs him to be. At no time is the aikidoka overpowering the opponent through strength and force. Aikido is a gentle art, where little force is needed. This is why it is ideal for people of any size, and stature. I see in your pictures that everyone is wearing white belts even those that are appearing to be doing very advanced things. Good observation! Indeed because Aikido emphases a non-egocentric discipline and promote peace through internal self-discipline that are no outward marking of rank. There are only two belt colors, black or white. The actual black belt is most often not even seen, as it is worn under the hakama or dark color coulotte or skirt. How long does it take to be a black belt? The short answer is 7 to 10 years. That is much more time than many other martial arts require, but that is due to the level of skills required to effectively use Aikido. It is much simpler to block a punch than to learn to blend with the incoming punch and to take control of the force that it delivers. Should I start with Aikido as a first art or should I learn something else first? A background in other martial arts, can give a broader view of what martial art suits you best. What another martial art gives may complement your learning of aikido. The conditioning and skills learned in aikido are quite different from other martial arts, so it is really learning a new and different skill. Is Aikido suitable for children? Aikido is taught to children of as little as 8 years old, and it is excellent for children to begin learning aikido at an early age .Unfortunately we do not have children’s classes due to the lack of time and the availability of teachers. Is aikido suitable for women? It is purely defensive, there is no aggressiveness. Promote peace, the word "Aikido" is often translated by "the Art of Peace"
In fact, our experience teaches us that women often learn aikido faster than men do, and often become extremely skilled at it. I feel that I maybe too old to start this! You are never too old to start aikido. The intensity of any technique is always controlled and dictated by the intensity of the attack. Therefore in a sense you are always in control of how far you want to go. We not only encourage you to go at your own pace but we will also slow you down as often as required. No one gains anything from injuries! What you will gain is better flexibility, agility and balance and the passion of learning an art that is endless in what it can teach us. Must I be in perfect health in order to do Aikido? Aikido is for almost everyone. A student does the best that he or she can. Never will we push someone to do or participate in anything that he or she believes is not within their capabilities. If you are not sure, we strongly recommend that you consult you physician. Also feel free to come and see us, we can help you decide if aikido is for you or not.